At Caesars Palace Hotel in Las Vegas on 15 April 1985, a Championship Middleweight Title fight took place - Marvelous Marvin Hagler and Tommy Hearns. This was the most exciting and intense 3 rounds in the history of boxing. Indeed, it was a legendary match that will be remembered forever. "Getting ready for this particular fight was very important for me. I knew that I had to be prepared. I was training very hard to be 110% in shape. For 2 1/2 months I was focused on my opponent. 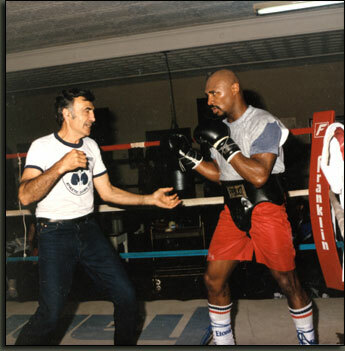 Goody and I started the training in Provincetown Mass, then moved it to Palm Springs to adjust Nevada climate and then 8 day's before the fight we moved to Las Vegas for the final tune up." Some Things to Remember: "To stay Champion, you have to always fight like the Challenger! When you are an athelete you can't Smoke, Drink, or be involved in the Night Life before you step in the ring, all the way to the end of your career. You have to be determined, and understand what you really want. Do you want become Champion Of The World? Do you want to STAY Champion a long time? Then this what you have to do - train hard, but...make sure you don't over train!"